The rail service between Galway and Oranmore is at risk of becoming a ghost train unless Irish Rail includes the station as a stop for all trains on the Galway-Dublin route, according to a local TD. One in three trains travelling from Dublin to Galway on weekdays passes Oranmore Station without stopping at present, meaning local residents cannot avail of the service to commute. Fine Gael TD Hildegarde Naughton, who is from Oranmore, has called on Irish Rail to include the stop in all services on the Galway-Dublin route in order to make it more attractive to commuters. “The reopening of a train station in Oranmore was an important development for the town and the surrounding region, but it will never realise its potential unless the service being provided is maximised,” she said. “The train service can have a positive impact on traffic congestion by taking hundreds of cars off the road at peak times, but only if a convenient and reliable alternative is being offered to commuters. “At the moment, several trains are passing Oranmore instead of stopping in it and each one is a missed opportunity to cater for passengers who might otherwise avail of the service. It makes no sense to bypass a major population centre,” she added. A train station had existed in Oranmore since the 1850s but closed in 1963. 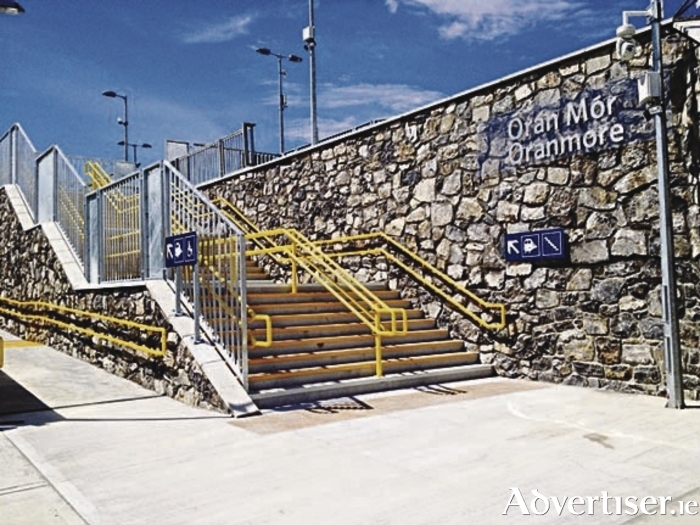 The new station was opened in July 2013 at Garraun, just outside the town of Oranmore. “It’s an excellent facility both for commuters and passengers travelling to and from Dublin,” said Deputy Naughton. “It’s just a ten-minute journey into the heart of the city without having to worry about traffic. “But an adequate service needs to be in place in order for people to trust the train and switch from road to rail. Many people in Oranmore travel to Athenry to get the train at present, because they’re not sure which service will stop at their local station. “Irish Rail needs to address this situation and demonstrate a will to make the service a success,” she said.